Hello Gulf Coast Section SEPM members! Spring has turned to summer and it is time for a second helping of the president's column. I would like to begin this column by honoring our outstanding 2014 section awardees. Our first awardee, Dr. David T. King, is Professor of Geology at Auburn University and winner of our Distinguished Service award. 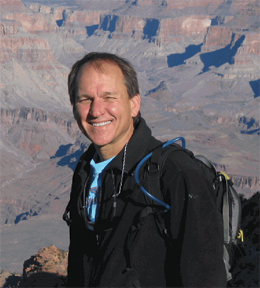 Our second awardee, Dr. Brian E. Lock, is Professor of Geology at the University of Louisiana at Lafayette and winner of our Honorary Membership award. Our third awardee, Dr. Shirley P. Dutton, is Senior Research Scientist at the Bureau of Economic Geology in Austin, Texas and winner of the prestigious Doris Malkin Curtis Medal. I extend my congratulations to these very deserving awardees and invite all of you to do the same by email or other social media. See more information about these awards and the honorees by following their links above. The GCSSEPM Executive Committee and Foundation Trustees are always looking for ways to provide more value to our members. It is consistently a topic we discuss via emails and at council meetings. One way we hope to do that this year is by implementing some upgrades to the Web site. First, we want to better acknowledge our corporate sponsors. On the right hand side of the Web home page we have instituted a revolving display of Perkins Conference and Section corporate sponsor logos. This is a nice eye-catching display that we hope will draw lots of attention. Each sponsor logo links directly to primary corporate Web site for that sponsor. On our Sponsorship page, corporate sponsor logos appear in order by contribution level starting with our Diamond sponsor ION Geophysical. Individual sponsors are listed under the year(s) of their contribution one level down. The truth is we have room for more sponsors at all levels! I'll take this opportunity to solicit your help. I encourage all of you who work at companies that are not on our sponsorship list to approach your management and suggest becoming a sponsor of the GCSSEPM. Second, I am working with our Web master Gail Bergan to update various data or links where we have fallen behind and gotten out of date. We are also trying to improve the logical nature and ease of use at our Web site. Hopefully, this will put everything at your fingertips so you won't have to hunt for information or links that you need. Gail will probably have most of these items installed, updated, relocated, or back up to specs by the time you read this, so give the Web site a tour. If you find anything we might have overlooked, then please lets us know. Third, we are trying to make the GCSSEPM Web page a place where members will venture to on a regular basis. To this end I have brought several ideas to the Executive Council for consideration. One of those ideas involves doing a better job of promoting our Ed Picou Fellowship Grant recipients. As many of you are aware, the GCSSEPM Foundation awards fellowships of up to $2500 for research projects in North America, the Caribbean, and the Gulf Coast Basin in particular to Mexican, Canadian, and U.S. universities. In just the past three years 37 fellowships have been awarded for research in sedimentary petrology, reservoir quality, paleontology, and other related geological and geophysical fields. Each of these students is required to present their research to the membership via two expanded abstracts published in the newsletter and at a Bob F. Perkins conference as an oral or poster paper, when the topic is appropriate. You are also probably aware that many/most of the student fellowship recipients do not complete these requirements. My idea is to encourage the recipients to complete these requirements by showcasing their research on the Web site. If each student were to prepare a 3-5 page expanded abstract about their research project, either proposed or completed, we could easily have a new area showcased each month. Then we could choose the best presentation(s) of the past few months for inclusion in the newsletter. With new research being posted to the Web site each month there would be incentive for members to return to the Web site more often. It would also be a source of pride and honor for the students to get their research showcased. Once established, I believe it would be a place where crafty recruiters might come to search for interns and permanent hires. This presents a winning situation for all involved. To get this started, our own Vice President, Thomas Hearon, has volunteered to present some of his PhD. research for the inaugural Web site showcase. Expect his write-up to appear on the Web site sometime in mid-June. I have been personally honored and deeply grateful to be involved in some of Thomas' research. I know he will set a very high standard for subsequent showcases to follow. Fourth, another idea to attract members to our Web site is to parlay our good reputation for knowing and understanding Gulf of Mexico stratigraphy. My idea here is to create a library of key well sections through important fields/reservoirs and make them available to members. It seems quite logical that the GCSSEPM would be the place to find such information. This idea was first proposed to me by Andy Pulham over a cold malted beverage and it seemed like a good one. Andy and I will generate a style template for how these logs should appear. The template will be put on the Web site and available to all future contributors. This idea is not as far along as the student research showcase but expect to hear more about it in the next newsletter. Now I would like to request some input/feedback from you, our membership. What would you like to see on our Web site? What additions or features could we implement that would make the GCSSEPM Web site a place you would visit more often? I am reaching out to you for ideas and suggestions to help make the Web site more useful. If you have any suggestions or comments on how the Web site could be improved, please send me your thoughts at jfiduk@exchange.slb.com. I'll conclude this column as I did in the last one by asking everyone in the section to participate as much as possible during 2014. Active participation is the easiest and best way to gain value from our society. Run for office, volunteer for a committee, become a business representative, or help recruit new members to the GCSSEPM. Any and all of these things will provide you with more satisfaction from membership and also benefit the society. Until next time.